Procopius noted in early medieval times that Slavs had intermediate pigmentation. According to the 10th century Persian historian and geographer Ibn al-Faqih, there were two types of Slavs: those with swarthy skin and dark hair that live by the sea and those with fair skin and light hair that live farther inland. The former is probably a reference to southern Slavs, while the latter is probably a reference to northern Slavs (both western and eastern ones), both descriptions are in accordance with the physical characteristics of modern northern and southern Slavs (of course, in a rough way, as Ibn al-Faqih's descriptions are rough generalizations). Southern Slavs (Bulgarians and former Yugoslavian Slavs) are known to be genetically very highly admixed with native Balkan people, so northern Slavs, especially those that live around the Slavic homeland, represent the ancestral Slavic type much better. So it is safe to say that the original Slavs had fair skin, light hair and concomitant light eyes (of course, here I am making a rough generalization like Ibn al-Faqih). Procopius' reference may have been just to southern Slavs (who were much closer to the Byzantine territory than northern Slavs) and their native Balkan subjects and slaves, who were then probably in a process of fusion, and southern Slav aristocrats and soldiers may already have been highly admixed with native Balkan people then. Procopius lived during the time when the Slavs crossed into the territory of the Roman Empire, so I don't really see any reason why he would confuse the Slavs with the pre-Slavic population of the Balkans that would eventually be Slavicized. The eastern Slavs themselves acknowledged that they were darker than Balts and Finns. See also this. "So while the Frankish, Slavic (among whom the Germanic peoples were counted) and Turkic (which were thought to include the Russians and the Volga Bulgars) peoples and other inhabitants of the sixth zone were generally melancholic and splenetic folk"
OK, you may be right about the confusion issue, but still, the Slavic aristocrats and soldiers he saw may have already been highly admixed with Balkan natives. The eastern Slavs themselves acknowledged that they were darker than Balts and Finns. It is very normal Eastern Slavs to be darker than Balts and Finns, because, as you acknowledge, the Baltic area and environs is the center of depigmentation among Caucasoids. As to your Bohemia argument, I don't think Czechs represent the ancestral Slavic type, as the Slavic homeland was more to the northeast, probably somewhere around Belarus, Poland, European Russia and Ukraine. Medieval Islamic writers also used the word "Slav" ("Siqlabi" in Arabic) to denote only the Slavic speakers. I don't know which was the meaning used by Ibn al-Faqih, but as he was a scholar and not a politician or military leader, it is very probable that he used the word only to denote Slavic speakers. the Slavic aristocrats and soldiers he saw may have already been highly admixed with Balkan natives. I can also include the non-aristocratic and non-soldier Slavic tribespeople that Procopius saw in this category. That's another case of total idiocy. They just take a small sample and conclude from that things which are totally absurd. They should have looked for the population structure and typological correlations in the population in the first place. Because if you have a population in which the lighter individuals have significantly more Baltid influences than the darker ones, which have significantly more Dinarid and Mediterranid influences, it's quite obvious how this "result" came along. It has zero to do with blue eyes and even less to do with uprising - sorry - they seem to be retarded not to look at the older works if doing such a job and coming up with a milieu theory which is just. It's so obvious they deal with different racial forms in their sample, the pigmentation is just the clue to that, one of the decisive traits, but not the reason in itself. Would they have done the same in Norway, things might have looked very different actually. Btw, the brown-eyed Czech composite looks very much like a friend of mine, who is a Balkan Turk. I think that the color of the eyes don't count very much to make an attractive man. It can be a something more, an accessory, but what really counts it is the form of the oval. You can observe Mediterranean men with blue eyes, but with developed chin too and they are considered very attractive, as the actors Alain Delon or Franco Nero. Their blue eyes are almost an element of strangeness but attractive. with this characteristic can seem a few virile. Recent genetic studies like Underhill 2009 showed that Slavic R1a1a has been present in Central Europe since the Neolithic. Slavic population there is quite old and homogenous genetically. So probably Proto-Slavs looked more less like people living there now, as they are the same people. Migrations didn’t affect Central and Eastern Europe as much as some people thought. Slavs are not mixed with Balts and Fins, who are predominantly N1c, not present in Poland. Also very little Celtic and Germanic admixture – R1b around 10% in Poland to 2% in Russia. A lot of R1b comes from Armenians, Jews and other minorities. I1 is at negligible level and some clades like I1-P are exclusively Polish not present anywhere else . East Germany on the other hand is heavily mixed with Slavs, around 30% R1a1a and East European modal haplotypes . Slavic language was spoken there till XVIII century. That’s why East Germany has higher percentage of blue eyes than West Germany. Southern Slavs are heavily mixed with Balkanic population, so they are naturally darker. Ancient Slavs of Central Europe, Corded Ware and Andronovo R1a1a people were the same people, and they were close to Poles and Russians autosomally and pigmentation wise as some studies show . They also spoke similar languages as Slavic languages are the most conservative and archaic Indo-European languages most similar to Proto-Indo-European and closely related to Indo-Iranian. Linguists like prof. Alinei linked Corded Ware with Proto-Slavic language and this is now confirmed by genetic studies. Celtic and Germanic people are not R1a1a and cannot be linked with Corded Ware or Andronovo. Pigmentation maps, genetic studies and linguistic evidence fit together and they are all useful. Doesnt it also depend on what you are used to? The Romans wrote about the "piercing" blue eyes of Germanic barbarians that one can barely stand. German folktales on the other hand speak about forreigners with horrible demonic black eyes as if they are right from hell. There is an image of the 4 races of the "Holy Roman Empire" bring gifts to Holy Roman Emperor Otto III. "Sclavinia" (Slavs) in redblond hair, "Germania" (Germans) in goldblond hair, "Gallia" (Celts) in black hair and "Roma" (Italians) in brown hair. Kaiser Otto himself is painted in redblond hair as the Slav girl. Surounded by grey or black haired clerics and warriors. I am skeptical that dominance perceptions of college students in Prague generalize broadly. College students in Austin, Texas, or Mumbai, India, for example, might have opposite perceptions. Stereotyping based on appearance is to some extent a read of links between appearance and local social class structure, and while the authors talk about how appearance may influence actual behavioral patterns in people with a given appearance, the study didn't investigate the actual behavior of the models (i.e. the accuracy of the viewers). Context matters a lot in creating stereotypes and appearance perceptions. For example, in the United States, a cop, either black or white, is statistically more likely to incorrectly shoot an innocent young black man believing him to have committed a crime than he is to incorrectly shoot an innocent young white man. But, in Afghanistan, a young black man is probably less likely to be shot by a fellow U.S. soldier than a young white U.S. soldier -- almost all black men in the theater are follow alliance soldiers. That's not relevant in this case. The point is that there is mixture between Central European Slavs and German. We only care about medieval CE Slavs. "R1a1a has been present in Central Europe since the Neolithic. Slavic population there is quite old and homogenous genetically. So probably Proto-Slavs looked more less like people living there now, as they are the same people." Rather not. Because first of all, R1a1a entered the region in pre-Slavic times and being related to the Corded Ware culture groups in Central Europe probably, which were most likely Indoeuropean, but can't be defined as being "Slavic", even if an ancestral Proto-Proto-Slavic group was among them. Secondly, that there is a relative genetic continuity means sometimes close to zero for a phenotypical continuity. Obviously the population in the East changed, be it due to modification or selection, most likely both, significantly since early medieval times. All ancient archaeological complexes which could be defined as being Proto-Slavic or Old Slavic were usually predominantely dolichocranic and most of the time also rather leptoprosopic, so if assuming they were light pigmented = Nordoid rather. If looking at this morph now, thats nothing like that but similar to the Baltid minority element already present then, but dominant now. As for the comparison as such, the Dinarid-Mediterranid-Alpine complex being most likely pre-Slavic and/or German, depending on the exact place, the Baltid Eastern European and came mostly with the Slavs, Nordid can be either. Slavs, Baltic people, and Finns all arrived from farther south in relatively recent times. They clearly mixed with fairer people to arrive at their current distribution and current color gradient away from the Baltics, and away from the NW in general. However, I would think that such a gradient already existed before Slavic expansion, but more importantly, that the people in the main river valleys between the southern Ukraine and Ural mountains (the likely homeland of all three populations above) by far never were as dark as the adjacent S/SE Balkan or Anatolian populations. However, their pigmentation may cause them to get much darker more easily with sunlight (than northern phenotypes). I guess you don't include Poles among CE Slavs, as they are closer to the ancestral Slavic type (fair skin, light hair and eyes, roughly speaking). Also Poles are probably more depigmented (including skin, hair and eyes) than Germans in their averages (at least that is what I have seen in depigmentation maps so far). Anyway, as Czechs and Slovaks don't represent the ancestral Slavic type (as they are mainly descended from later Slavicized natives), there is no need to further this debate about the physical characteristics of the original Slavs. A small addition to the above: my friend was born in and lives in Istanbul, but he is entirely descended from Balkan Turks that emigrated to Turkey during the turbulent years of the early 20th century (like my mother). It rates Westslavs and Balts as "Nordisch" (Nordic) and "Ostisch" (literate "Eastern", possibly "Alpine" in english "Race science") looking. The Eastslavs it rates as "Ostbaltisch" ("Eastbaltic") looking. Funny enough the map consideres the southern FIN as eastbaltic looking too, while the northern Fin are rated "Mongolic". ALso, it shows that look as a minority in Iceland. The Southslavs it consideres mostly "Dinarisch" (Dinaric) looking with "Nordic" minorities. Poles are irrelevant since it is unlikely that Procopius would be familiar with them or that the Slavs of early medieval Moravia would look like modern-day Poles. The evidence (literary and pictorial) is pretty clear that the medieval Slavs relevant to our discussion were darker than the medieval Germans. That, of course, is to do with the pre-Slavic and pre-Germanic, and probably also with pre-IE, population structure in the relevant areas. Even then the sources say that the Slavs from Bohemia and Moravia are among the darkest of them all. Also I'd say it is perfectly possible that the Slavs of that time, even others, were somewhat darker than the Germanics they were used to see, especially if comparing with the Varangians and Medieval Germans of some areas - I'm speaking of the Arab sources primarily now. 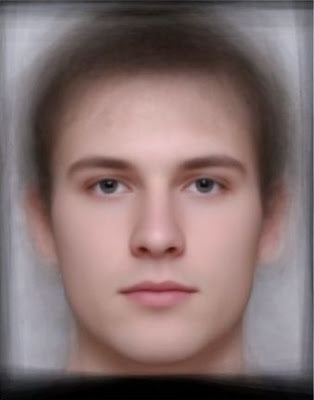 But this somewhat darker means just a frequency and that they were as dark as the complex this composite face shows is quite unlikely - in my humble opinion. 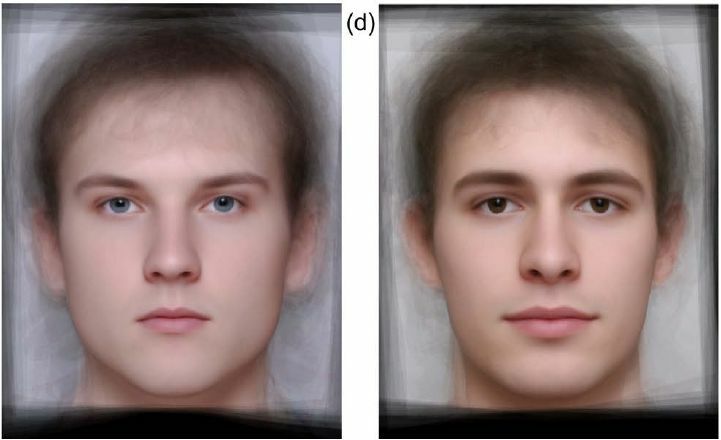 Being depigmented doesn't necessarily correlate with hair colour or eyes (but possibly red - not blonde hair). The most depigmented people in Europe are from Britain and Ireland, not central or eastern Europe. Someone who is depigmented will have a pinkish hue to their skin. Race studies in those years of Germany (Nazi era) were highly politicized. We should start a new wave of race studies, which will be completely objective and independent from politics and will be based on both genetics and anthropometry. The `German` composite hardly looks like any German I`ve seen. I`d say he looks like a Briton tbh (i.e. he could have been from anywhere in the British Isles). I really didn`t like the paper quoted. It looks as if it`s made by an amateur who is obsessed with racial stereotypes. Don't take ancient sources so seriously, especially when the geographically closest Slavs to Arabs were the Balkan Slavs, the darkest of all Slavs (and the genetically most distant ones to the original Slavs). Northern Slavs (all of non-Balkan Slavs) as a whole probably aren't darker than Germans, but maybe even lighter than them (of course, not in any significant degree of difference). As to Scandinavian Germanics, they are lighter than both Germans and northern Slavs. These are probably all to do with population structure much before (probably Neolithic and even Palaeolithic) the appearance of the current ethnicities in the relevant regions. This study will upset bunch of people believing themself as `Master race' Hitler had ordered the scholars into gas chambers.